Radon is a radioactive, colourless, odourless and tasteless gas. It comes from the decay of uranium found naturally in soil, rock or water. Radon is quickly diluted when it is released into the outside air. However, when radon seeps into closed spaces like a house it can quickly accumulate to levels that are dangerous for humans to breathe. Radon exposure is the leading cause of lung cancer in non-smokers and is responsible for 3200 lung cancer deaths in Canada each year. The only way to know if a home or building has high radon levels is to test. Radon levels can fluctuate significantly hour to hour and day to day so Health Canada recommends that a long-term radon test of at least three-months duration be conducted. All areas and buildings in Canada have the potential for high radon and all buildings should be tested to determine radon levels. Geological conditions in some areas, such as in the interior of British Columbia, result in a much higher relative radon hazard. In Canada approximately 6.9% of homes have elevated radon levels. 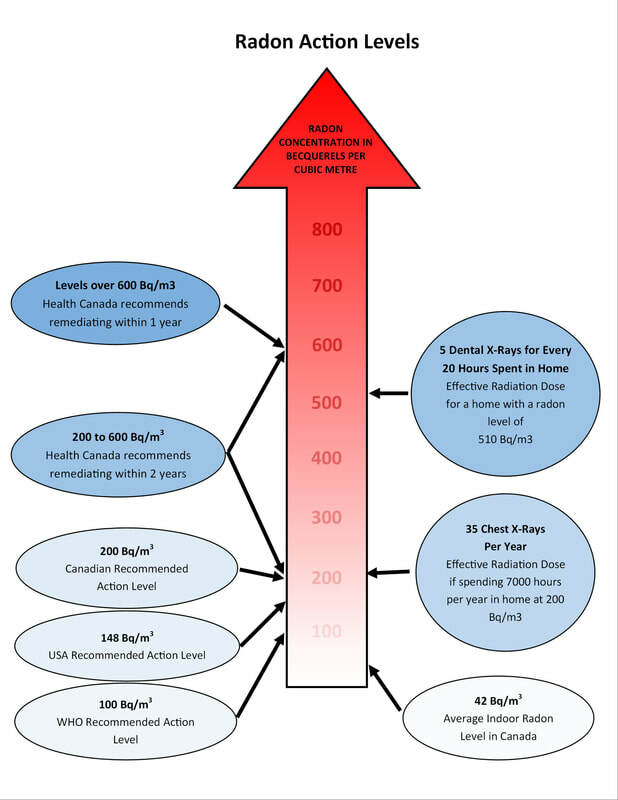 However, our testing in the Revelstoke area indicate approximately 50% of the homes have radon levels over the 200 Bq/m3 Health Canada Action Level.